In addition to new, live musical performances from the band, Buckwheat’s World episodes will feature slice-of-life scenes of Buck doing what he does every day. He might be working on one of his vehicles, tending his menagerie of animals, boiling crawfish, hanging out with friends and bandmates, fishing on the bayou, taking care of Buck business. 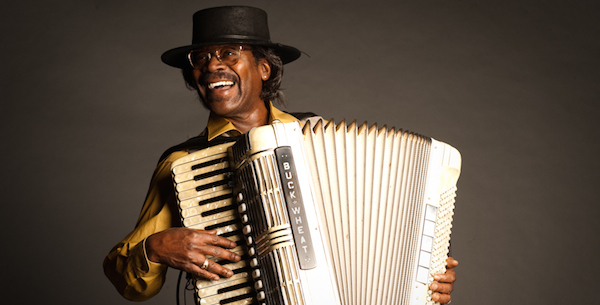 All the things that make up Buckwheat’s World and the lifestyle of Southwestern Louisiana. The initial musical performances will be filmed at Dockside Studio in Maurice, Louisiana with the band playing in the casual setting of the studio’s beautiful pool house overlooking the Vermilion River. Buckwheat’s World is being shot and directed by Louis Alvarez and Andrew Kolker, celebrated documentary filmmakers who got their start in Louisiana with such classics as “Yeah You Rite!” and “Louisiana Boys—Raised on Politics”. They’ve won two Peabody Awards and kept audiences laughing and thinking with such films as “American Tongues”, “Vote for Me” and “People Like Us”. Their latest film “Getting Back to Abnormal”, about New Orleans politics, will be on the POV series on PBS July 14. Below, watch the trailer for Buckwheat’s World.